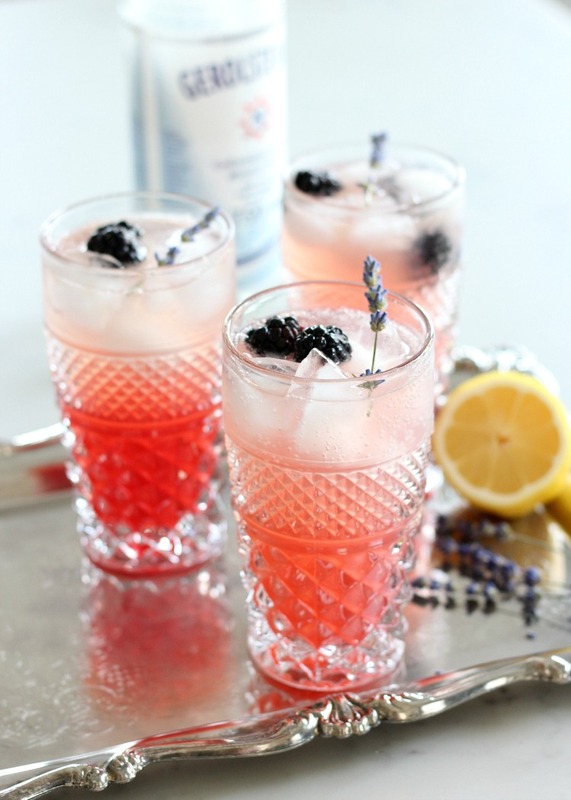 Impress your guests with this lavender blackberry sparkling lemonade. 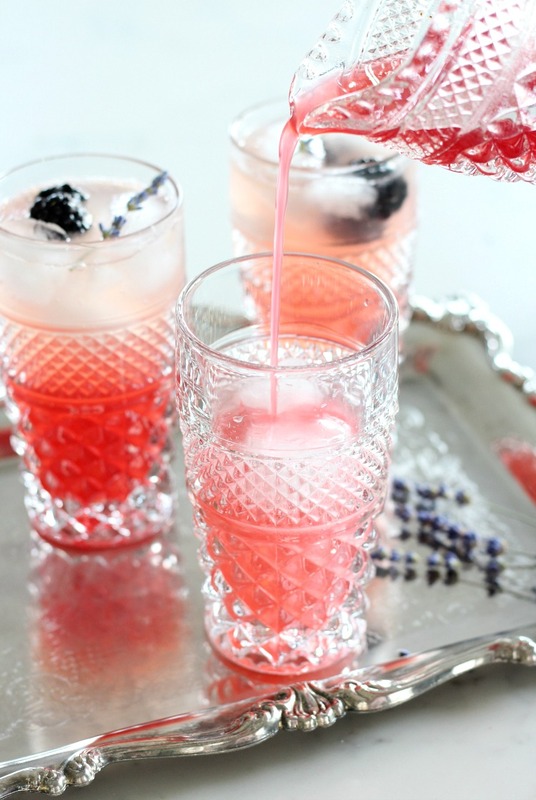 A beautiful, delicious and refreshing summer drink recipe! Hello, all! I’m back from my trip to beautiful British Columbia feeling rested and inspired. Usually we wait until July to take a break, but our son was playing in the Canadian University/College Golf Championship, so we decided to tag along. It was a fun experience, and I can’t wait to spend even more quality time with my family in the coming months. Since the weeks are winding down and summer break is shortly on its way, I’m back today participating in Krista’s Seasonal Simplicity series. You can catch up on my summer DIY project I shared the last time around, as well as the other participants’ ideas by going here. Do you entertain more over the summer months? We’re usually quite busy throughout spring, but enjoy having friends over for casual dinners and evening chats around the fire June through August. It’s something I look forward to every year. Hopefully the weather is good this time around. And, what’s better than kicking things off with a signature drink or cocktail? 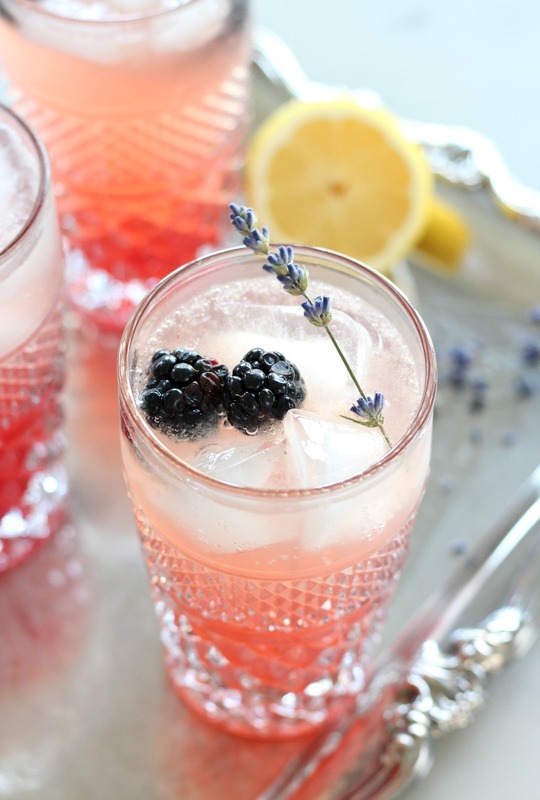 Isn’t this lavender blackberry sparkling lemonade pretty? Having grown lavender for many years now, I tend to have many dried bundles set aside for recipes and other projects. With a new crop on its way, I’m finding new ways to use up last year’s. During the holidays, I made lavender sugar scrub and I’ve also infused sugar to sweeten whipped cream, tea and more. I thought this time around it would be fun to use in a drink. If you’re wanting to grow your own culinary lavender, select ‘Munstead’ for its sweetness. You can check out the specifics of the variety I grow here. It’s a lovely perennial that looks and smells gorgeous year after year. I absolutely love it! 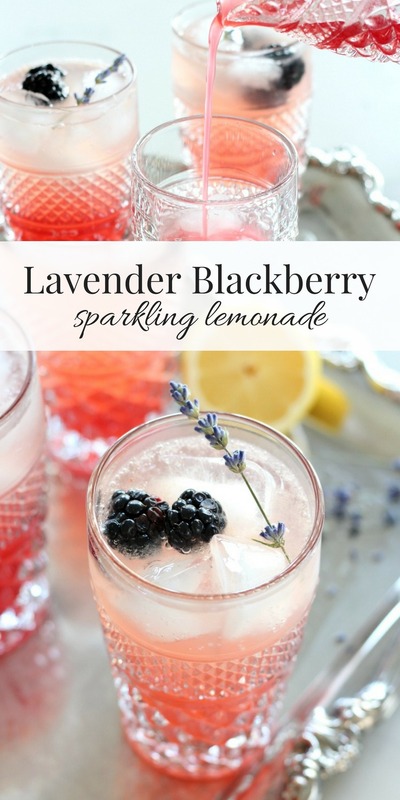 This lavender blackberry sparkling lemonade is easy to make and can be served with or without alcohol. I love how refreshing and thirst-quenching it is on hot summer days! Start by making a simple syrup concentrate with honey (or sugar), blackberries, dried lavender and water. Combine with freshly squeezed lemon juice. To mix a drink, add ice cubes to the bottom of a tall glass. I found these pressed glasses (and creamer) at the thrift shop for next to nothing. Definitely a good score. They capture the light beautifully, don’t you think? For a cocktail version, add an ounce of vodka or gin first. Then, fill the glass about half way with sparkling water. Next, top with concentrate and add more sparkling water if needed. Finally, garnish with a few blackberries and a sprig of dried lavender. 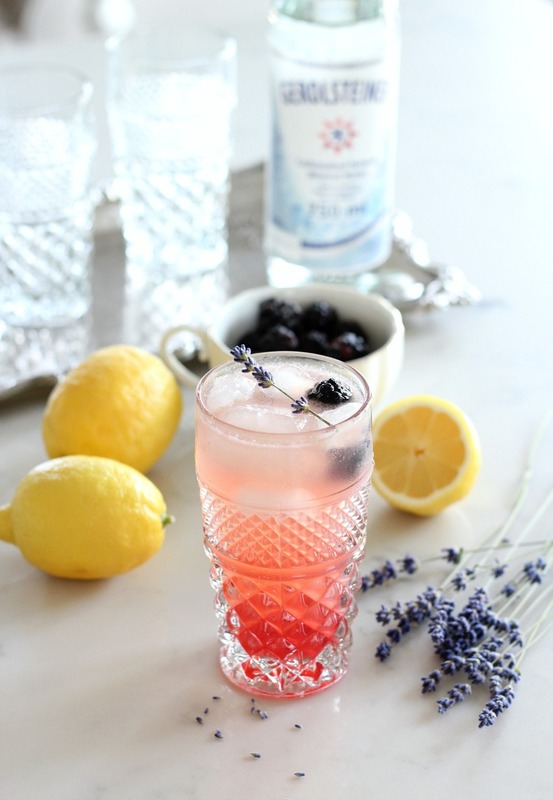 The lavender and blackberry in this lemonade is subtle. Of course, you can play around with the flavours by increasing or decreasing quantities. Keep in mind that too much lavender can start to taste soapy. Best to use it sparingly. I used honey for the sweetener, which also changes the taste depending on the type you select. Sugar works well, too. Want to make this lemonade ahead of time for a summer party or picnic? I found these cute individual bottles at IKEA. You should be able to find similar ones at the dollar store. A mason jar with a lid works perfectly, too. Just make sure your container has a lid to keep the drinks bubbly. Whip up a batch in the morning, store them in the fridge, then transfer to a bucket of ice just before your guests arrive. 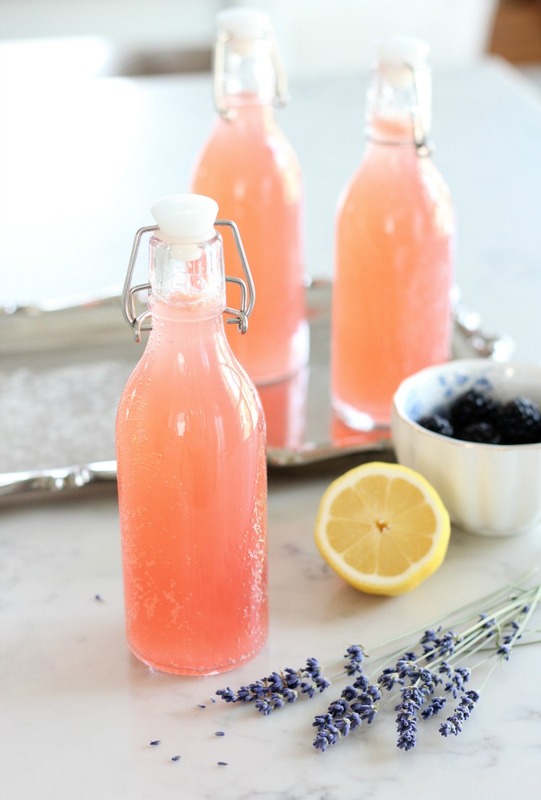 You can even make lavender blackberry sparkling lemonade labels for a bit of fun. Enjoy! 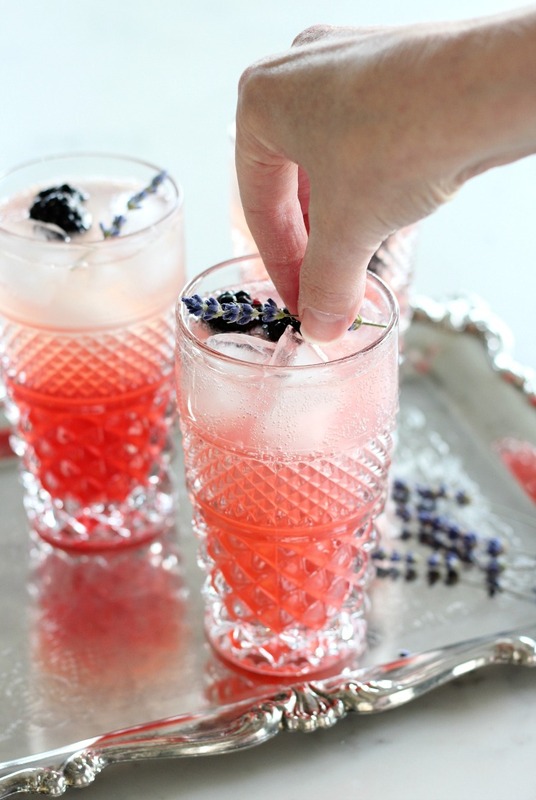 A beautiful, delicious and refreshing summer drink recipe that's perfect for any occasion! In a small sauce pan, add honey (or sugar), water, blackberries and lavender flowers. Bring to a boil over medium-low heat, stirring occasionally. Simmer on low for another 5 minutes, mashing blackberries with the back of a spoon. Remove from heat and pour through strainer. Stir in freshly squeezed lemon juice and allow to completely cool. Store in the refrigerator until needed. Use within 5 days. Add ice cubes to the bottom of a glass. For a spiked version, add 1 ounce of vodka or gin. 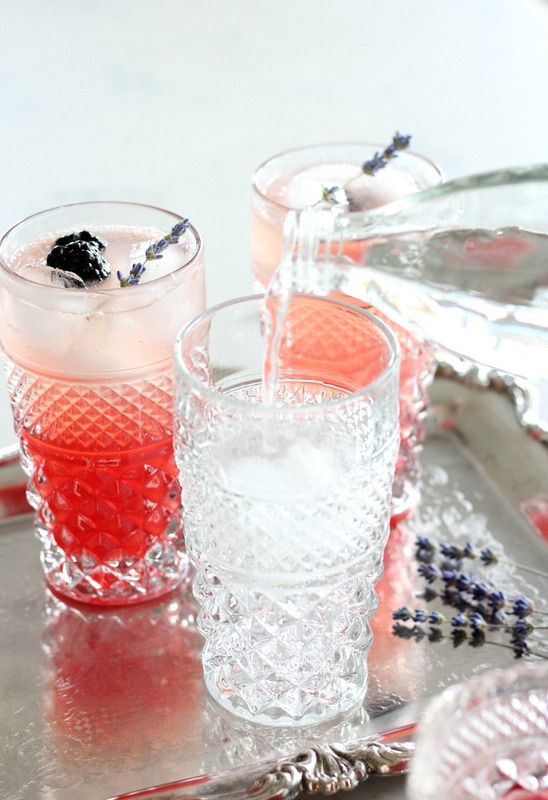 Fill glass about half way with sparkling water (about ¾ cup). Pour in ¼ of the simple syrup concentrate. Top with more sparkling water if necessary. 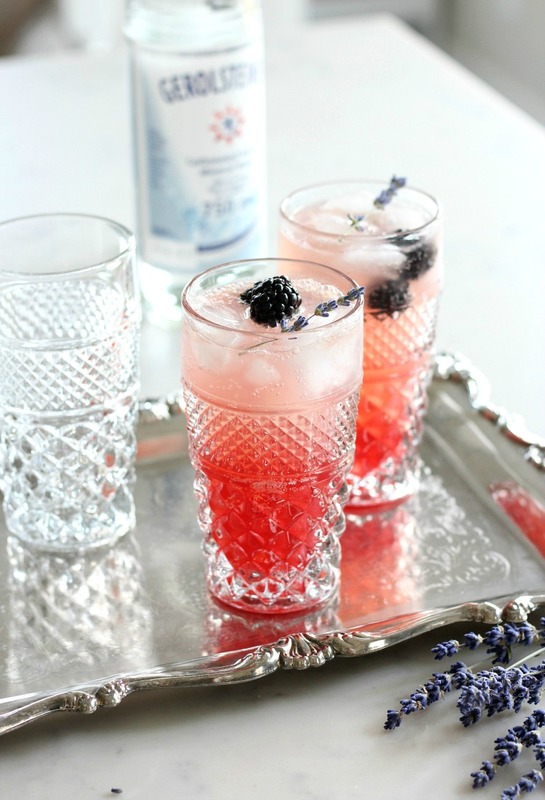 Garnish with blackberries and a sprig of dried lavender. 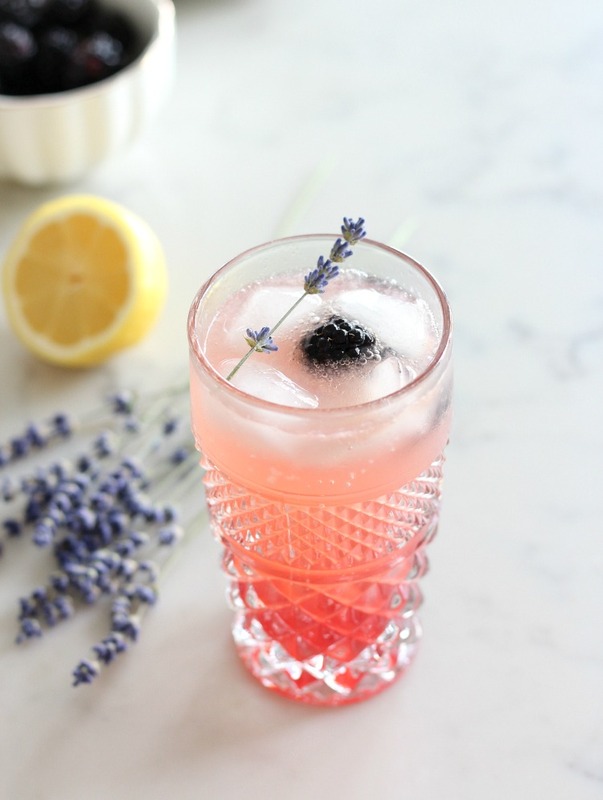 The lavender and blackberry in this lemonade is subtle. Of course, you can play around with the flavours, but too much lavender can start to taste like soap, so keep that in mind. I used honey for the sweetener, which also changes the taste. Sugar works well, too. Now for more summer recipe ideas! Absolutely gorgeous, Shauna! 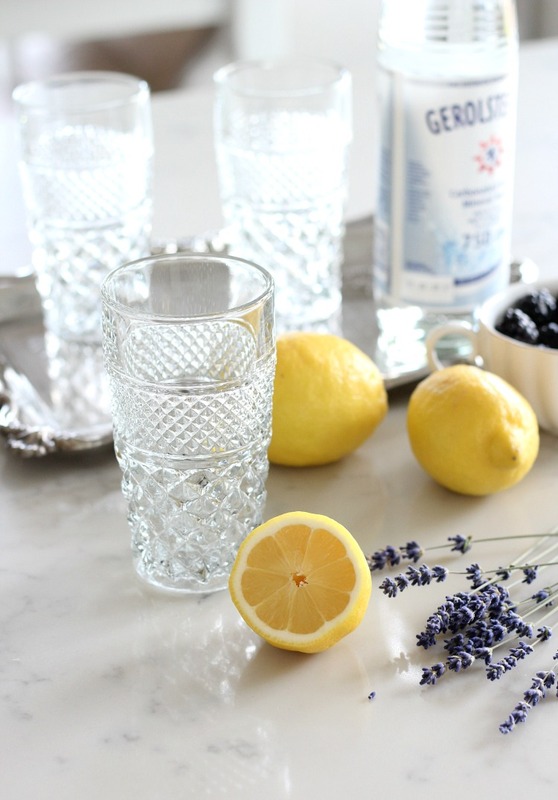 We were both on the lemonade train… it’s my favourite summer drink – and I will have to try this version for sure. Pinned for later! Thanks for being part of this hop, friend! This looks so refreshing and your photos are stunning! Oh my this drink looks amazing Shauna! I love the flavour combination you created…now I can’t wait for my lavender to start blooming.